This is the 4th segment of the series “Shoddy Workmanship. Have you ever noticed the time and attention focused on bad leadership? Articles abound and are very descriptive on who bad leaders are and what they do. Why all the attention on what leaders do wrong? Possibly this is because the number of bad leaders outnumber the great ones and therefore there is more evidence of this type of behavior to observe. Possibly some thought leaders are more astute in defining what not to do rather than how to lead correctly. This focus, however, leaves a huge leadership development vacuum because there is no model or template of great leadership to observe. One thing we can say for sure is that the lack of clarity and consistency about great leadership creates much confusion. One of the greatest points of confusion is the hunt for the Holy Grail – the one leadership action or trait that will turn mediocrity into gold. Much like the wind, we often see the impact of great leadership but describing its essence is much more difficult. 1. How Common Is Great Leadership? Gallup and Teleometrics report that less than 15% of leaders are high achieving. Organizations describe the leadership pipeline as one of their biggest risks and concerns. The common view today is that everybody can be a leader yet we live in an age where leaders are being weighed in the balance and found wanting. True and genuine leaders are a rare breed indeed. One of the biggest dangers in leadership is that the common and average leaders think they are great. https://9by9solutions.com/2016/03/why-leaders-cant-lead-the-dunning-kruger-effect/ This blind spot inhibits improvement since leaders who need to improve think they have already arrived. Leadership is not a process or even a set of practices. Instead it stems from a philosophy. If one does not understand this basic and fundamental fact, he or she will get caught up in the current trend of trying to dissect leadership, to tear it apart in a vain attempt to understand the critical elements that make it successful. (I recently observed a well-meaning but misguided Commissioner of a large public health agency in the southeastern United States attempt to implement “Good To Great” concepts with her leadership team. The attempt was a miserable failure as leaders did not understand or agree upon the philosophy behind what why they were trying to accomplish. As a result they simply called their current leadership behaviors by these new labels and moved ahead with little or not change. It was interesting to watch the autocrats use the “get the right people in the right seats on the bus” to justify letting people go whom thy did not like or respect.) Great leadership does not start by trying to copy a “guru’s” set of how-tos. as if great leadership will make their life a heaven on earth. As a result, they slice and dice leadership actions trying to find the secret sauce, the Holy Grail, that is at the core. People debate endlessly about the most important leadership trait and arguments over the best leadership styles are endless. In doing this, the beast is killed by thought leaders attempt to study it. 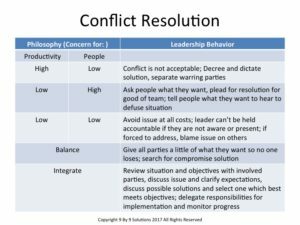 https://9by9solutions.com/2016/04/dissecting-frogs-and-consistent-leadership-behavior/. The critical question then is what do we know about great leadership that will focus us in the right direction. The first and most important concept to understand is that a unique leadership philosophy creates great and authentic leadership. Recently an article published in the Harvard Business Review captured my attention. The authors of the article, “Good Bosses Switch Between Two Leadership Styles”, (https://hbr.org/2016/12/good-bosses-switch-between-two-leadership-styles) argue that successful leaders utilize two different strategies for organizational success. In suggesting this misapplication of an important truth, the authors lead practicing managers into practicing mediocre and average leadership. It is not because they propose the wrong focus but because the authors err in how to apply the right focus. As was discussed in the first three parts of this series, these dual foci of people and productivity are exactly the issue that Douglas McGregor raised in his famous two leadership philosophy book, The Human Side Of Enterprise. 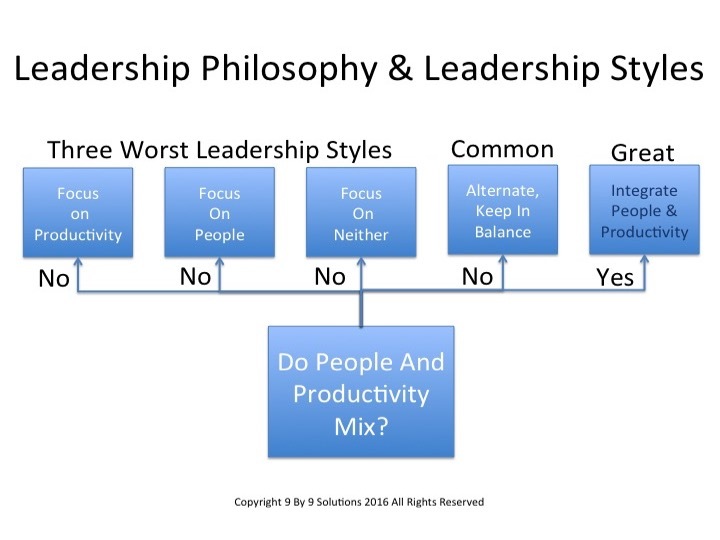 McGregor described a “Theory X” leadership philosophy (people and productivity do not mix) that leads to multiple but less than effective leadership styles. He also describes a second leadership philosophy, “Theory Y”, (people and productivity mix and must be integrated in everything a leader does) as the only approach that leads to genuine and authentic great leadership. This Theory Y philosophy lays the foundation on which genuine participation, engagement and collaboration are built. •	Effort in work is as natural as work and play. •	People will apply self-control and self-direction in the pursuit of organizational objectives, without external control or the threat of punishment. •	Commitment to objectives is a function of rewards associated with their achievement. •	People usually accept and often seek responsibility. •	The capacity to use a high degree of imagination, ingenuity and creativity in solving organizational problems is widely, not narrowly, distributed in the population. 3. 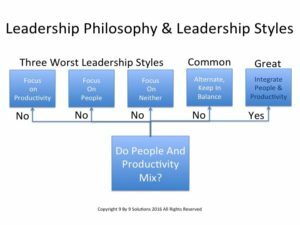 Is Leadership Philosophy More Important Than Leadership Character? Some argue that the leader’s character is what creates leadership greatness. They claim that integrity, passion, or will, are at the core of authenticity. These proponents of the character-based approach to leadership begin to flounder when they encounter autocratic leadership that is totally honest with their people or people placators who have a strong will or passion to make sure their people are content and happy. The dilemma is the character trait is what is desired but the leadership style is all wrong. These character traits based leadership proponents then argue that is a magical mix of character traits that creates leadership greatness (which of course no one can define). It is not that character is unimportant. Rather, it is what character causes a person to believe about people and productivity that matters in leadership. 4. How Does A Genuine Theory Y Philosophy Differ From The Leadership Style That Vacillates Between The Two Concerns? 1. Keep people safe and away from unacceptable risks. 2. Set and expect high performance standards to challenge, engage others and ensure organizational success. 5. Does A Theory Y Leader Always Use The Same Style? Recently I read a question asking if it was inappropriate for leaders to violate their leadership style. This shows what happens when a leader becomes dogmatic over the wrong things. It is not the leadership style that must be safeguarded it is the leadership philosophy. A Theory Y philosophy does not always lead with the same exact leadership approach. Leadership is neither a cookie cutter nor a by the book prescriptive recipe. It always involves an application of the leadership philosophy to situations the leader faces. A Theory Y philosophy guides the leader to the appropriate action in a given situation by causing that leader to ask, “if I truly believe that a high concern for people and a high concern for productivity must be integrated, what should I do in this situation?” Sometimes that might lead to an approach that appears very autocratic (an employee who is about to engage in a high risk, unsafe action (i.e., sexual harassment). At other times it might lead to backing off and allowing a motivated and aggressive employee to learn by trying something the leader knows will probably fail. Most of the time it will lead to collaboration and engagement with the employee about some aspect of the work. The style varies; the philosophy must never waver. 6. Does A High Achieving and Authentic Leadership Style Perform Different Tasks Than Average Or Low Achieving Leaders? This is an interesting question because many look for the one big thing I need to do as a leader to cement my place as a great leader. Surely great leaders do something differently than average or terrible leaders. High achieving Theory Y leaders generally perform the same leadership tasks as average or low achieving leaders. However, the way they do those tasks is different from the low achieving or average leader. Take conflict resolution for example. 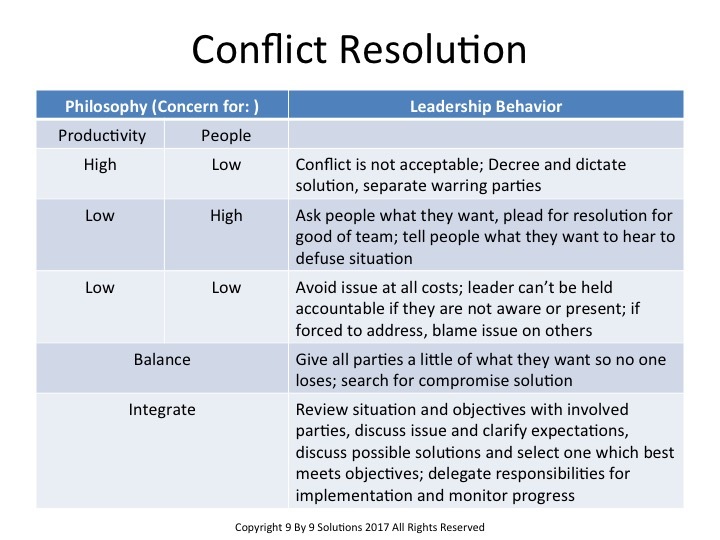 All leaders manage conflict but the way they approach it varies significantly. 7. What Is The Key To Becoming A High Achieving Leader? There is a simple answer to this question that is excruciatingly difficult to implement. It takes the consistent application of the Theory Y philosophy to every action the leader takes. This is why leadership is one of the easiest acts to perform in a moment of time, yet one of the hardest to sustain over an extended period of time. 8. Can Leaders Genuinely Espouse Theory Y But Practice Inappropriate Styles? Great leadership requires skills and the building of sills is essential but these skills grow out of a philosophy, not the reverse. Most leadership development efforts fail because they start off by focusing on skill rather than philosophy. This brings us to a dilemma. There are some potential or new leaders who do have a Theory Y philosophy but who have only encountered Theory X models of leadership. More than likely, these leaders copied those faulty models and found them to be ineffective. While this leader may be uneasy with the fact that these Theory X models do not “feel right”, they often do not know how to change. What occurs is tragic as one or both of two errors occur. First that well-meaning leader may attempt to keep the scales balanced by doing some “people stuff” to balance out the autocratic behaviors. (When leaders know both people and productivity are important but they don’t know how to integrate them, balancing the scale becomes the fallback position). The second error is even worse. This well-meaning leader continues to talk the right talk but practice behaviors that are diametrically opposed to what they espouse. This is the quickest way to loss of trust and respect which often disheartens these leaders as they cannot understand how why if they are trying so hard, their leadership is not working. 9. How Does A Leader Build a Culture Around A Theory Y Philosophy? Many people discuss the responsibility of leaders to develop other leaders. The way this is done it to develop a deep understanding of the Theory Y philosophy and how that philosophy is applied to various situations. A leader attempting to develop a Theory Y team will constantly ask, “If we believe the people and productivity are integrated in every situation, what should we do in this situation?” The answer to that question is not always easy to define and often takes thought and contemplation. It often requires first defining what the other philosophies would do in order to determine how Theory Y is different. It is in this discussion, however, where understanding and depth of leadership is built. 10. Does A Theory Y leader Always Use Collaboration and Involvement of Others? Involvement and engagement of others is a staple of the Theory Y style because leadership involves others. It involves building their capabilities and harnessing their capabilities to develop optimal solutions. But involvement and engagement are means to an end. That end is maximizing people and productivity. So while Theory Y leaders would always be truthful, they would not share information with an employee that was speculative and contemplative and which would raise concerns and angst. The Theory Y leader would share that information when it became concrete. Additionally, a Theory Y leader would fire an employee when the fit was not appropriate. This would be consistent with this philosophy wanting everyone to succeed even if that success was not in his or her own organization. The major point is this: a Theory Y leader leads from a position of strength. Strength to set high and challenging expectations, strength to help staff be successful, strength to listen and be open to other ideas and strength to give honest feedback so people can improve to the extent of their capabilities. The question then that faces every leader who would be great is what do you believe about people and productivity and how are you applying those beliefs in your day-to-day behavior?